The servers march in synchronized formation, identical in dress and step, like the guards at Buckingham Palace. The food comes out on bright, angular dishware, arranged with such photogenic care that it almost seems uncouth to eat it. Between each table, there’s enough empty space to fit another, smaller, less expensive establishment. It’s the kind of restaurant that Patrick Bateman from American Psycho would kill someone over. 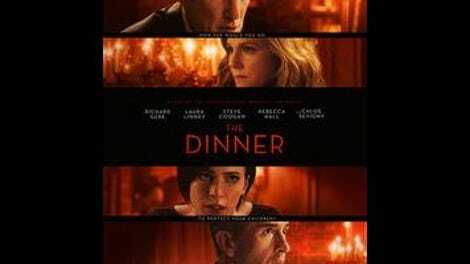 And in the twisty, secrets-we-keep family drama The Dinner, it’s a pleasant backdrop for an exceptionally unpleasant conversation. Here, Paul (Steve Coogan) and his wife Claire (Laura Linney) have agreed to share a pricey meal with his brother, congressman and gubernatorial hopeful Stan (Richard Gere), and his wife, Katelyn (Rebecca Hall). It would be unfair to spoil their topic of discussion, but let’s just say it involves their teenage sons, who have gotten themselves into… something that must be addressed. Preferably over digestifs. Plenty will ballpark that something before The Dinner gets around to dramatically unveiling it, like Joan Crawford throwing back a metal cover to find a dead rat festering on her plate. Others will just have eaten this meal before. It’s the third adaptation of Dutch author Herman Koch’s 2009 international bestseller, whose cynicism burned so hot off the page that it practically singed the fingertips. The novel unfolded unpredictably, deliberately trying readers’ patience with a hundred pages of unreliable narration—a fine-dining experience retold in scathingly microscopic detail—before wheeling out a surprise main course of shocking revelations. This adaptation, the first in English, moves the action from Amsterdam to New York, but preserves said revelations. What gets lost in translation is Koch’s caustic humor, woven into the fabric of his first-person prose. Without it, The Dinner is a feast of leftover insights and ironies: decorum masks darkness, polite society rarely is, etc. Oh, what Michael Haneke, that master scold, could have made of this material! It’d be his My Dinner With Andre, nailing us to that table, force feeding us several courses worth of bourgeois savagery. (There is, to be honest, already a touch of his Benny’s Video in the book.) Instead, adaptation duties have fallen to Oren Moverman, writer-director of The Messenger, Rampart, and another recent vehicle for Gere, the well-intentioned misfire Time Out Of Mind. Moverman is generally good with his actors, but only Coogan, playing his sourpuss persona completely straight for once, finds an actual character among these wealthy, distraught relatives. The structure is partly to blame: Never committing to the eponymous event as a dramatic anchor, The Dinner makes a total hash of Koch’s nonlinear storytelling, cutting away almost at random to quick glimpses from the fateful night in question and getting bogged down in lots of expository backstory (hideously over-lit to make it clear we’re watching flashbacks). Stylistically, it’s a mess; Coogan’s voice-over narration comes and goes without rhyme or reason, as the director gussies up the oddly infrequent restaurant scenes with the anxious circling of his camera. It’s always a little unfair to hold a movie up against a book. Besides, Moverman earns begrudged appreciation for making something so jagged—in its tonal and temporal leaps—out of a novel this well-read. (No one would confuse the film, under his nervous stewardship, for a prestige production.) But judged on its own terms or against its source material, The Dinner lacks bite, focus, and the courage of its convictions. Even the story’s big moral quandary—how far should you go to protect your children?—gets muddled by the histrionic climax, as the actors snipe at each other across a luxury den, before a final pulled punch. The Dinner wants to chill bloodstreams by revealing what decent, civilized people—the kind that adopt children from other countries, consider their politics liberal, and wine and dine in high class—are truly capable of. But as food for thought goes, that’s pretty lukewarm.